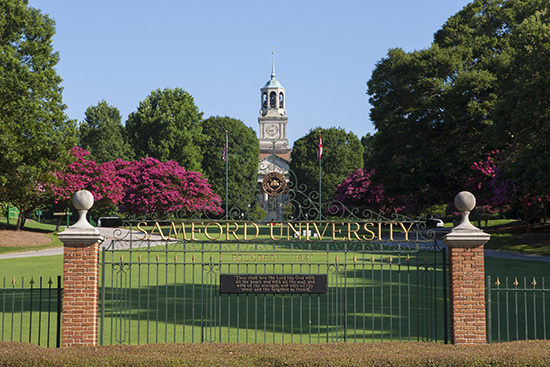 Samford University’s board of trustees approved candidates for graduation, new academic programs, new faculty and new facilities among other actions in its spring meeting May 3. In what was described as their “most significant action” of the meeting, trustees approved 1,074 candidates for May graduation, pending completion of degree requirements. Continuing their longstanding tradition, trustees paused to pray for the graduates. Several new degree and academic programs in the College of Health Sciences were approved, pending final accreditation approval. The Bachelor of Science in respiratory care and Master of Science in respiratory care degrees will combine the academic foundation in the first year of respiratory care courses with clinical experience in the second year. The Bachelor of Science in health-care administration is designed to prepare students for entry-level management positions in health-care organizations. The new Master of Science degree in health-care administration is designed for executive management positions, providing a competitive edge in project management and quality improvement, according to university officials. A new Master of Science degree in nutrition provides advance training in human nutrition science and can be combined with a dietetic internship. A new minor in public health will provide students with an introduction to the public health field by focusing on health prevention, promotion and policy making. A new joint degree program between the School of Public Health and Beeson Divinity School will allow students to enroll simultaneously in the Master of Social Work degree and the Master of Divinity or Master of Arts in Theological Studies degree. The joint program will prepare students for ministry requiring theological training and skills in social service provision. Trustees also approved a new minor in paralegal studies in Cumberland School of Law for students wanting to explore an interest in law but not necessarily a paralegal career. Michael Canfield, instructor of cardiopulmonary sciences in the School of Health Professions. Canfield, who earned two degrees from the University of Alabama at Birmingham (UAB) has worked for Southern Scientific LLC since 2011. Tadashia Jabril Cooper, instructor of cardiopulmonary sciences. Cooper also earned two degrees from UAB, where she has been a clinical simulation specialist since 2014. Annalise DeVries, assistant professor of history. DeVries currently is content director at Odie and Partners in Homewood, Alabama. She earned her doctorate from Rutgers University. Keith Elder, dean and professor, School of Public Health. Elder earned his doctorate from the University of Maryland and has been chair of the Department of Health Management and Policy at St. Louis University since 2013. Megan Lindsey-Taheri, instructor of nutrition and dietetics. She previously was ALS health educator at the ALS Society in Huntsville, Alabama. She earned her bachelor’s and master’s degrees from the University of Alabama, Tuscaloosa. Five faculty members were appointed to endowed chairs for the first time, including David Bains, S. Louis and Ann W. Armstrong Professor of Religion; Larry Davenport, Paul Propst Professor of Natural Sciences; Woodrow Hartzog, W. Stancil Starnes Professor of Law; Corey Johnson, John R. Sampey Jr. Research Professor in Chemistry; and Nena Sanders, Ralph W. Beeson Chair of Nursing. They join 20 other faculty members who hold endowed chairs. In other business, trustees gave final approval to several construction projects: a new residence facility, final renovation plans for the buildings that will house the College of Health Sciences, additional surface parking adjacent to those buildings, and construction of vehicular and pedestrian connectors to College of Health Sciences buildings. The next full meeting of the board of trustees will be Sept. 9.